Read herebefore making a comment. As noted in the linked post, violence has been reduced to levels more analogous to that of the South during reconstruction than to an active war. In related news, the Zaytun Unit will complete its withdraw from Iraq by the end of December. HT: Army Wife, who reports that many folks report being 'bored' on their current tours. Perhaps it is time to start withdrawing after all. 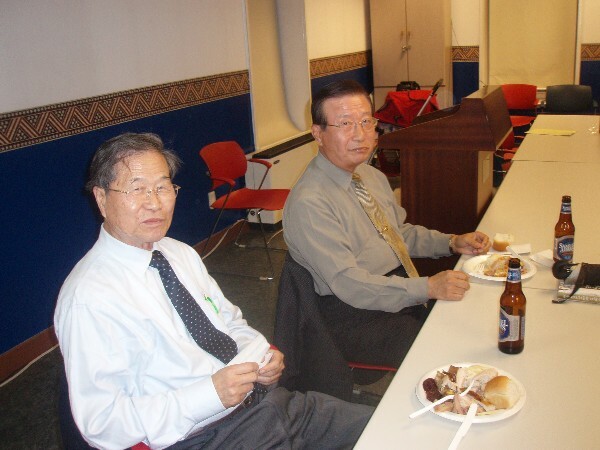 Republicans Abroad-Korea had its third annual Thanksgiving dinner on Saturday, November 17th. About 35 people were on hand this year (a slight increase from about 30 last year and roughly 25 in 2005). We all had a good time and enjoyed a real American feast together, despite being half-a-world away from our homeland. Our guest speaker this year was Lee Dong-bok, a professor, fellow at the Center for Strategic and International Studies and former National Assemblyman. He gave an interested message on US-Korean relations and the aftermath of the resent summit between Kim Jong-il and Roh Moo-hyun. Thanks go to Bob Gilbert for procuring the food, George Geddes for organizing the dinner and RAK Chairman John Lee for getting our guest speaker. Special thanks go to Michael Maddox and his staff at the USO canteen for their assistance in making this year's dinner a success. McCain also got one vote from one of our non-American guests. Asside from our normal Korean guests, this year's dinner also had guests from Canada, Mongolia and New Zealand. 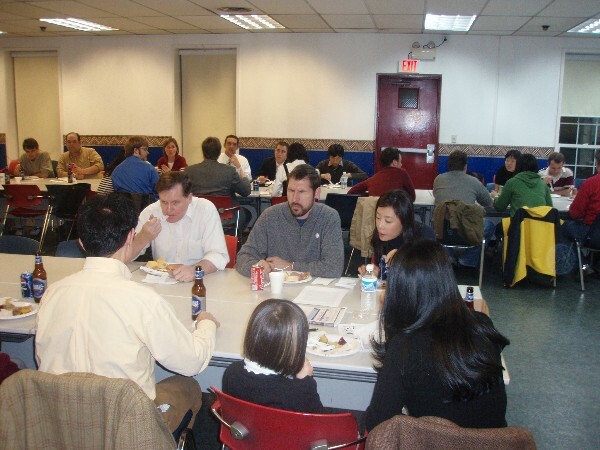 Kurt Mohay (white shirt) enjoys dinner. 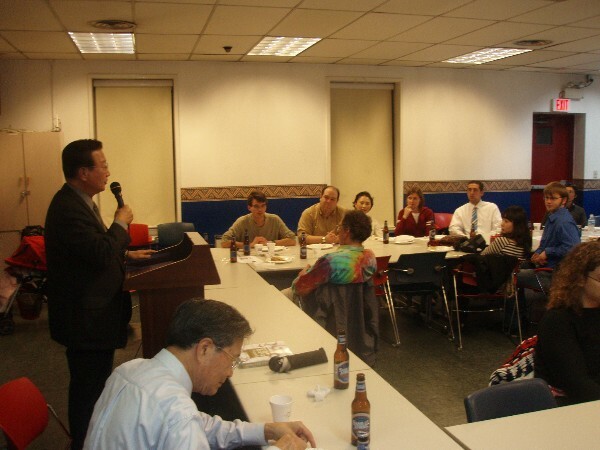 Republicans Abroad-Korea Chairman John Lee with guest speaker Lee Dong-bok. Guest speaker Lee Dong-bok. Adelia Jackson is sleeping in her stroller on left side of the picture. I, on behalf of Republicans Abroad-Korea, congratulate president-elect Obama on his victory. Like Republicans elsewhere, I will support him when we agree and oppose him when we disagree. But in any case, as the incoming duly elected president of my republic, he has my loyalty. When I oppose him, it will be a loyal opposition. Tonight, more than any night, I hold in my heart nothing but love for this country and for all its citizens, whether they supported me or Senator Obama, I wish Godspeed to the man who was my former opponent and will be my president. Americans never quit. We never surrender. We never hide from history, we make history. I thank Senator McCain and Governor Palin for their efforts in this election. Andy Jackson and Kurt Mohay registered voters in Songtan on September 20. They helped 23 people register to vote and request absentee ballots, including a civilian contractor who is about to head out towards Iraq. Thanks go out to Kalani O'Sullivan, who set up the event and provided the table and chairs we used. Luckily, the shelter that Kanali placed us under (which cannot be seen in the pictures below) protected for the most part from the rain that hit around noon. Kalani O'sullivan (standing) and Kurt Mohay at the voter registration table near the main gate to Osan AB in Songtan. Kalani also provided two signs, one of which can be seen here. Being busy is good. Kurt and Andy assist three people. Good luck to Tom Brady on his recover from an ACL injury. Tens of thousands of fatasy owners are out for the season as well. Here are a few links for researching Namibian news.